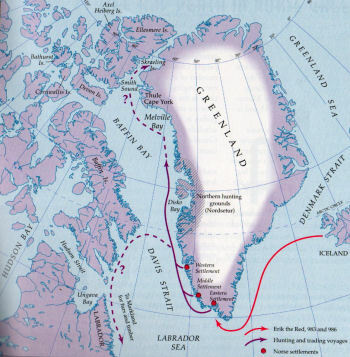 The earliest documentary references to the Norse settlement in Greenland occur in two Papal documents dated 1053 and 1055. However, we do have the account given in the Saga of the Greenlanders. According to this saga, at some time in the early 10th century Gunnbjorn Ulf-Krakuson sighted land to the west of Iceland when he was blown off course while sailing from Norway to Iceland. The Saga of the Greenlanders goes on to tell how in 982 Erik the Red was sentenced to the 'lesser outlawry', that is three years banishment from Iceland, for manslaughter. Erik decided to look for the land that Gunnbjorn had sighted. After sailing west for what must have been 500 kilometres, he found an extremely inhospitable landscape. He the sailed south and, after rounding a cape (Cape Farewell), he found a coastline with long fjords with good pastureland. When Erik returned to Iceland after his period of banishment, he set about encouraging people to settle in the new land, which he had named Greenland. He led 25 ships with would be settlers for Greenland. According to Íslendingabók (written 1122-23), this was 14or 15 years before Iceland adopted Christianity, which would make it 985-6. Only 14 of the 25 ships actually reached Greenland. 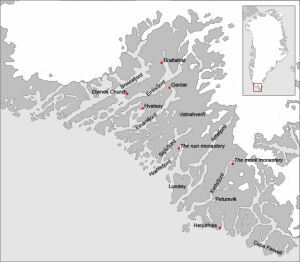 Erik settled in Eriksfjord in the centre of what has become known as the Eastern Settlement. This settlement eventually covered some 200 miles of the coastline towards the southern tip of Greenland. North of the Eastern Settlement was a strip of some 500 km of inhospitable land, but to the north of this the land was better and a new settlement - the Western Settlement was established here. About 400 Norse farms have been located in the Eastern Settlement and about 80 in the Western Settlement, however, it is not known how many of the farms were occupied at the same time.